Back when I was first trying to research fake meat and not having much luck finding what I was looking for, I read a lot about a brand of fake meat from Canada, Yves Veggie Cuisine. People RAVED about their products. So when I finally found them in one of my local stores, I was pretty excited to try them out. The first product of theirs that I'll review is Yves Meatless Pepperoni. The plan for this was to throw it into a stromboli, but I was worried about the results, so I also picked up some real-meat pepperoni, just in case. Before actually baking it into the delicious homemade pizza crust, I had to check them out. Visually, these kinda resemble pepperoni, if all you know about pepperoni is that they are small round red disks. The biggest problem was merely a random occurrence, which I'm sure most packages wouldn't have - a couple of the slices, instead of tiny specks of mysterious colored substances, had huge blobs of mysterious colored substances. One was yellowish, the other was a grayish brown. Neither looked terribly appetizing. I did not eat those two slices. The next step, after visual inspection, was to smell them. Not that I could help it - as soon as I opened the plastic, I was hit with a terribly unpleasant smell - that intense gluten-y flavor that I just knew would translate to the flavor as well, and I was correct. It had no flavors that one would associate with pepperoni. It wasn't just that they tried to make it taste like pepperoni but it came out mildly pepperoni-ish… there was no spice whatsoever. The ingredients list indicated that the product contained "spices, garlic and onion powder" but obviously not enough to actually taste them. Now that I've bashed the appearance and the flavor, let's talk texture. For those who may not remember because it's been too long, real-meat pepperoni is kinda greasy (let's not lie here…) and chewy. This stuff was a little crumbly. It sort of fell apart in my mouth while I was attempting to chew it, which was extremely unpleasant. To be fair, I didn't cook it at all, and it's possible that the application of heat does something to the texture to improve it. If the texture were the only problem, I probably would have tested that out, but I know for a fact that heat would not add pepperoni flavor to something that had none to begin with, so I ended up ditching these and resorting to my real-meat pepperoni. 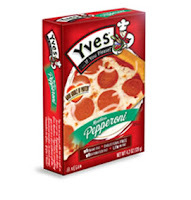 If you're looking for a fake meat substitute for pepperoni, do not eat these. Instead, try these instead. Sorry for the lack of post last Friday - I was dealing with a death in the family and was doing funeral stuff all last week, and just didn't manage to fit in any review-writing. But now here I am, with another fabulous review for you all. 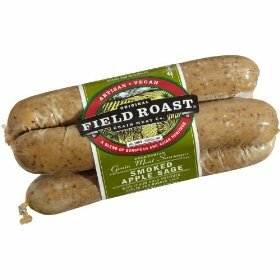 This week, I finally got a chance to test out one variety of Field Roast Grain Meat Sausages - the Smoked Apple Sage, specifically. I had this recipe that I'd found online a while back for a roasted pumpkin and garlic lasagna and I had a feeling that the flavors in the sausage would go well with the lasagna. Plus, adding fake meat to it would still keep the spirit of the original post, which was a Meatless Monday post. Still meatless! The lasagna took a long time to put together, as most lasagnas do, and it turned out more dry than I tend to prefer for my lasagnas, but it was tasty. I made sure to taste the fake meat sausage before adding it to everything else, just to make sure it wasn't horrible, and that the flavors would indeed mesh. It had a fairly good flavor alone, and was just a little bit spicy. I'm not sure if it's something I'd just pop in a bun and chow down on, but as part of this recipe, it really added a nice textural element. I don't think there was a whole lot added flavor-wise, since the rest of the ingredients were pretty flavorful, but overall, it was definitely a good combo. I'm not sure what else I'd use this sausage for, really. The website had a recipe for some breakfast polenta with peppers and onions, which sounds kind of good, but a lot of work. This positive experience does give me hope for the other flavors of this brand, though. Hopefully the flavors of the other sausages are also as good. I'm testing out another Boca veggie burger this week - it's Boca Cheeseburger. Obviously not vegan, this burger has cheddar cheese mixed right into the patty. I admit, I'm not sure exactly why this is something especially nifty about it, since it takes about ten seconds to put a slice of cheese onto a burger, but hey - whatever people want to do with their veggie burgers is none of my business. So, usual routine with the veggie burger - couple minutes per side in a lightly oiled skillet. I am such a veggie burger pro by now. Served up this time on a couple slices of toasted ciabatta as I had no hamburger buns in the house. I highly recommend this, if you can get your hands on some tasty ciabatta. I often get to bring some home from the bakery where I work - we make some awesome ciabatta. Anyway, back to the veggie burger. Toasted ciabatta, some ketchup, a crispy-looking veggie burger that apparently has the cheese built right in - let's do this thing. First bite - awesome. This tastes, to me, just like a real-meat cheeseburger. I don't say that a lot, but these are fantastic. I eagerly chowed down on the rest of it, and am looking forward to eating the remaining three burgers in the box. I kind of wish the cheese was also an imitation cheese so I could be even more impressed, but I'm okay with real cheese being used here.